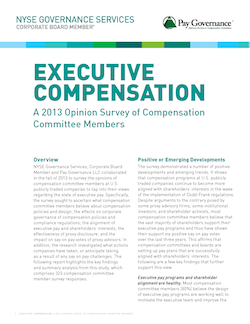 Highlights of Executive Compensation Opinion Survey of U.S. Company Directors New York, November 12, 2013 - A mere 18% of directors believe the SEC's new CEO/median employee pay ratio disclosure will actually improve corporate governance, according to an opinion survey released today by NYSE Governance Services, Corporate Board Member and Pay Governance LLC, an executive compensation advisory firm. 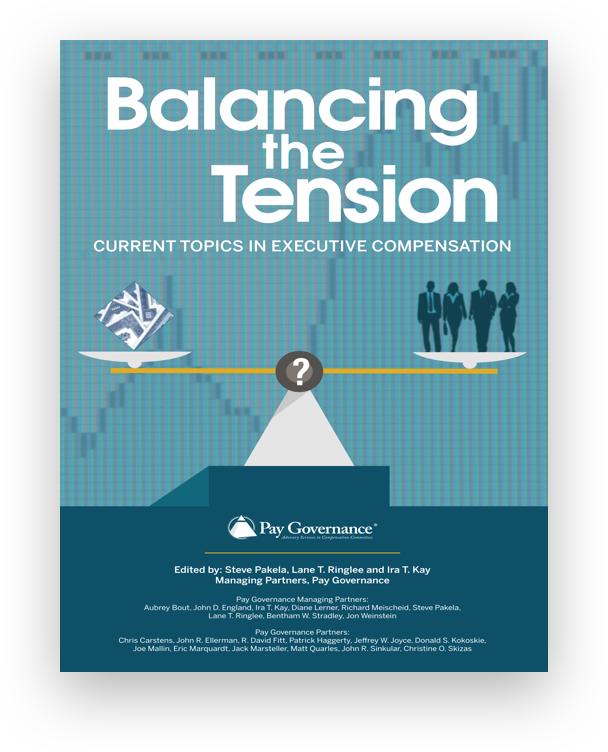 The comprehensive survey, designed to tap the views of directors serving on compensation committees at public company boards, offers insight into what policies and activities they believe are working to achieve alignment with shareholder interests and challenges they will face in 2014. While directors clearly believe CEO/median employee pay disclosure is not an effective reform measure, the survey shows that many actions taken by companies are having a positive effect. For example, 80% of compensation committee members believe the design of executive pay programs are working well to motivate the executive team, and 70% agree they are creating alignment with shareholder interests. This finding is consistent with previous Pay Governance research that has demonstrated that most companies have realizable pay aligned with total shareholder return (TSR). The survey also sought to analyze the effect of shareholder say on pay votes for the last three years and the results point to a few tangible effects. Eighty-two percent (82%) believe that as a result of say on pay voting, their proxy disclosure has improved; 71% report they have taken steps to review incentive plans; and 65% shifted their pay mix from time-based to performance-based plans. Directors surveyed were less clear on governance improvements as a direct result from say on pay. Less than half of directors believe say on pay has had a positive effect on corporate governance; only a third believe pay programs overall have improved. 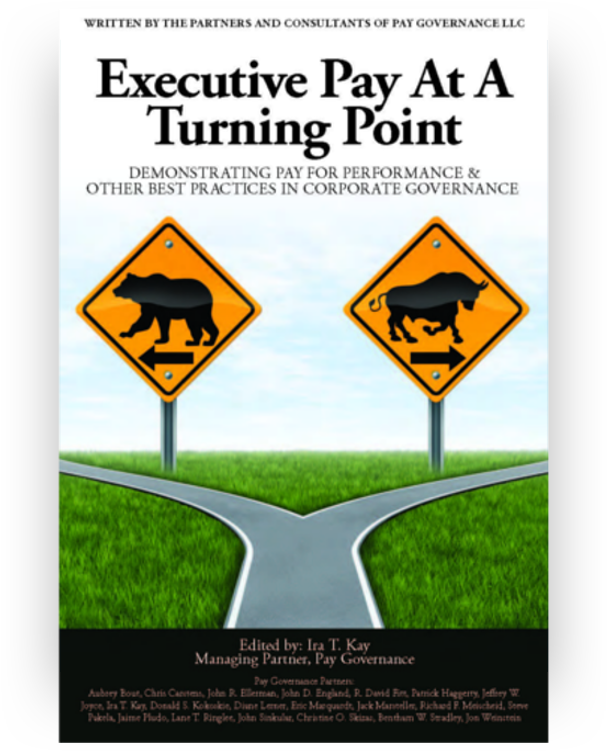 "Even though I have traditionally opposed rules and legislation that let shareholders sit on the shoulders of directors and second guess their decisions without having access to all the facts, you can't help but admit that say on pay has helped compensation committees improve their governance with respect to the pay for performance structure of plans, severance plans, and improved disclosure of the committee's thought process," said TK Kerstetter, chairman, NYSE Governance Services, Corporate Board Member. "I also think shareholder activists are a little surprised at how well companies have been able to align compensation plans with investors' interests, resulting in high approval vote totals." The survey also measured directors' opinions regarding proxy advisors and found that while 56% believe the policies of proxy advisory firms such as ISS and Glass Lewis have resulted in improved disclosure, only 43% agree these parties have actually improved pay for performance alignment. Another third of directors surveyed believe proxy advisors actually damaged the ability for companies to set appropriate pay levels that motivate and retain executives. NYSE Governance Services is an integrated suite of resources for public and privately held companies worldwide seeking to create a leadership advantage through corporate governance, risk, ethics and compliance practices. NYSE Governance Services leverages the expertise of Corpedia®, a leader in risk assessment and e-learning for ethics and compliance, and Corporate Board Member®, a trusted source on governance matters for company directors and C-level executives - both NYSE Euronext companies. NYSE Governance Services offers a range of training programs, advisory services, benchmarking analysis and scorecards, exclusive access to peer-to-peer events and thought leadership on key governance topics for company directors and C-level executives. For more information, visit www.nyse.com/governance.